Short of ideas for original and reasonably-priced Christmas gifts? Perhaps you share an interest in local or national politics and look-back nostalgically to the days of Harold Wilson, Vic Feather, Arthur Scargill, picket-lines, mills and mines. Indeed, several of our older comrade councillors from Ramsgate, are said to know all the words of the 'Internationale' and occasionally hum it during meetings. Don't fret, because here in Thanet, the past is never quite forgotten and Maggie never forgiven. Whether this involves distributing, the Socialist Worker, Thanet Watch or even making short propaganda videos protesting the non-existent closure of the QEQM. 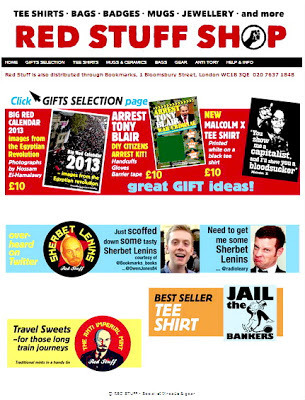 So you'll be pleased to hear that fashionable Xmas socialist merchandise is now available from our very own RedStuffshop.com. So forget Amazon or eBay, the closure of Argos in Margate or even Westwood Cross and instead shop local on the Internet where the parking is free. Build your own Blue Peter soap-box from easily downloadable instructions and make this a Christmas to remember, buy your grandmother (or even Mary Portas), an iconic 'Arrest Tony Blair' t-shirt. she'll love it. "Stereotypes are hardening into caricatures"
So said Bambi the war criminal ? Thanks for highlighting some marvelous items and promoting small business and best to see some biodiversity in this year's shopping list.